Vintage Doll Clothes for Toodles, Ginette, Gigi's Li'l Sister, Tiny Tears, Betsy Wetsy and Dydee Baby Dolls. Coat, Bonnet, Short Print Dress, Diaper Short Slip, Christening Dress Slip, Bunting Pillow, Overalls, Jacket Bunny Cap, Pajamas Knit Socks. Never pass up a vintage pattern because it s not the right size! We have a tutorial on resizing/grading vintage sewing patterns. If you enjoy vintage sewing patterns, especially the 1940s and 1950s, you may wish to book mark us and visit often. We list several times a week and keep adding to our ever changing inventory of all original vintage sewing patterns from the 1900s up to the 80s. WE SHIP WORLD WIDE! Our international shipping is one the most reasonable! We combine shipping to save our customers money ! 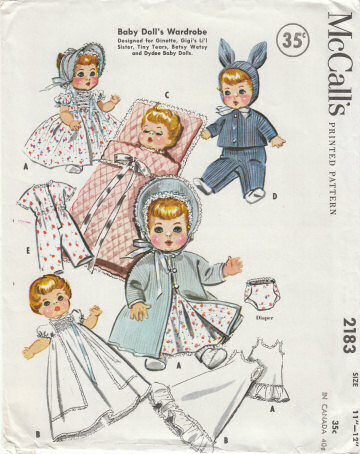 1970s McCalls 2970 Doll Clothes Vintage Sewing Pattern Doll Clothing Wardrobe For 5-6.5 Inch Fashion Dolls : Dawn, Dale, Rock Flowers, Kim and Tutti UNCUT FACTORY FOLDED.